Nikon’s Coolpix L20 is a great representative of a growing category of cameras: very affordable, easy-to-use point-and-shoots with surprisingly stellar image quality and a bit of fashion sense. The Coolpix L20 clocks in at just $130, but its image quality surpassed that of much more expensive cameras in our lab’s jury evaluations. In fact, it netted one of the best image quality scores of any point-and-shoot camera we’ve looked at so far in 2009—very impressive for a bargain-bin, AA-battery-powered camera. Although the 10-megapixel Coolpix L20’s image stabilization system is software based, it did a great job of capturing clear, unblurred images—even when I shook it around vigorously while taking a photo or zoomed in to the maximum capacity of the 3.6x optical (38mm to 136mm) zoom lens. Images were surprisingly clear and sharp for a nonmechanical image stabilization system. The deep red Coolpix L20 we tested had a lacquered plastic finish that one coworker likened to nail polish. The color looks sharp, and the lacquered effect feels nice in the hand. Even though it looks slick (in both the literal and aesthetic senses of the word), I was able to operate the camera with wet hands without losing my grip on it. It is a bit bulkier than your average pocket camera, thanks to the AA battery compartment. A huge, 3-inch-diagonal LCD dominates the back of the Coolpix L20. On the top of the camera you’ll find the on/off button; the shutter button; a dedicated playback button; and a button for switching between movie mode and still mode and for accessing the 16 scene modes. For zooming, the Coolpix L20 uses a wide-to-tight zoom bar, placed on the back of the camera where your right thumb would normally rest, rather than a ring around the shutter. The bar is easily operated and comfortable to use thanks to a grooved indentation for the thumb, but it’s something to take into account before buying if you prefer the ring around the shutter (I do). The L20 is quick on the shutter, as long as you autofocus before taking your shot. Holding down the shutter to autofocus before snapping a shot resulted in no noticeable delay in capturing an image. When I didn’t autofocus in advance, I noticed a slight delay between pressing the shutter and capturing a shot, but it was less than a second. The Coolpix L20 has a 3-inch LCD. One nice option—and one that’s rare on point-and-shoots at any price point—is the ability to zoom in and out in movie mode. The Coolpix L20 captures 640-by-480 AVI clips at 30 frames per second (with the option of knocking the resolution down to 320 by 240 at either 15 or 30 fps). When opening and playing the clips on an 2.4GHz Core 2 Duo iMac, QuickTime Player identified the files as Apple OpenDML JPEG format. In our lab’s subjective image evaluations, the Coolpix L20 produced some of the best overall image quality we’ve seen from a camera in the $200 price range. There was some image distortion, but not enough to detract from the overall quality, which had very good color accuracy and exposure quality. Battery life is something of a weak spot, but it’s not terrible: the Coolpix L20 fired off 230 shots before we had to replace its AA batteries, which is significantly short of the 300-plus shots many competing point-and-shoots offer. The remaining buttons on the back are standard issue: a dedicated menu button; a dedicated delete button; and a round pad (the multiselector) to navigate menu functions, turn on the timer, flash, and macro mode, and adjust exposure compensation. You don’t get full manual controls, which isn’t surprising for a camera at this price, but it also lacks manual ISO controls. The ISO automatically boosts in low-light settings when you have the flash turned off, but you can’t select specific ISO sensitivity levels in the camera. This is definitely an entry-level camera with an emphasis on ease of use. The Coolpix L20 has a few nifty features. Along with 16 scene modes and an Easy Auto mode that automatically selects the ideal mode based on the shooting environment, the Coolpix L20 has a Blink Warning feature that scans photos immediately after you take them and alerts you if someone in the shot blinked. That way, you can choose to keep or delete that embarrassing photo of your friend with his eyes closed. Also a nice feature for a camera in this price range is panorama assist mode, which guides you through the process of shooting panoramic images by keeping the ghosted edge of the last photo you shot visible while you shoot subsequent photos. All in all, the Coolpix L20 is a very affordable camera that performed very well in our image tests. 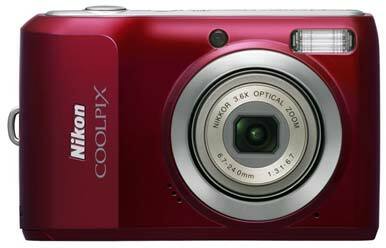 In terms of value, ease of use, and eye-catching looks, it’s one of the best bargain point-and-shoots we’ve seen so far in 2009. Don’t expect the manual controls you’d get with slightly more expensive cameras, but do consider the Coolpix L20 as a great option for beginners and night-on-the-town photographers.